Getting festive with Nicholson’s Pubs | It Comes In Pints? It feels like no time at all since we were last meeting with Nicholson’s for their Autumn Ale Festival, swilling down such delights as Thwaites’ 13 Guns and Great Heck’s American Classic. But as the days grow shorter and the fairy lights start going up in shop windows, the pub chain has already rolled out a range of 25 winter ales to quench the thirst of the great beer-loving British public. The crowning glory of this winter range are three very special brews created specially for Nicholson’s by their Cask Masters – the brand’s cask ale ambassadors – working alongside three popular beer writers and well-loved breweries. These beers make up the Christmas Ale Challenge, battling it out on social media to see which can come out on top and win the hearts of customers. We are glad that Assistant Brand Manager, Ben Lockwood, waited until after we tasted I Sea Santa (4.9%) to tell us what the secret ingredient is. “They used Welsh laver bread, which is seaweed,” he tells us. “It’s added at the end of the boil so you get the most from the flavours.” We try not to splutter into our glass. Brewing with beer sommelier and writer Melissa Cole, the Cask Masters created this unusual beer with Brains Brewery. You wouldn’t know that the beer contained such an odd addition without being told – it has a fruity, raisin nose with that banana-y, ester sweetness, and has great body thanks to the six different malts used. Hopped with Fuggles and Mosaic and with added spices and treacle, it tastes more like panettone than seaweed. “Working with Bill Dobson, the Head Brewer at Brains was great fun,” says Cole. “He likes to indulge the slightly crazy aspect of my approach to brewing. I’m particularly excited that we’ve used local laver bread in the brew as that particular ingredient is packed with umami and should make the beer deliciously drinkable.” She is not wrong. 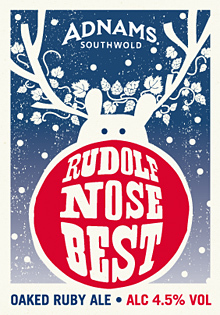 Next up is Rudolf Nose Best (4.5%), a red ale brewed with Boutique Beers author Ben McFarland and Adnam’s. We can really smell the cinnamon notes coming through here, courtesy of the cassia bark used in the brew, along with vanilla. Toasted oak chips add an unusual, smoky dimension to the aroma, and the beer has a warming, spiced quality on the palate. 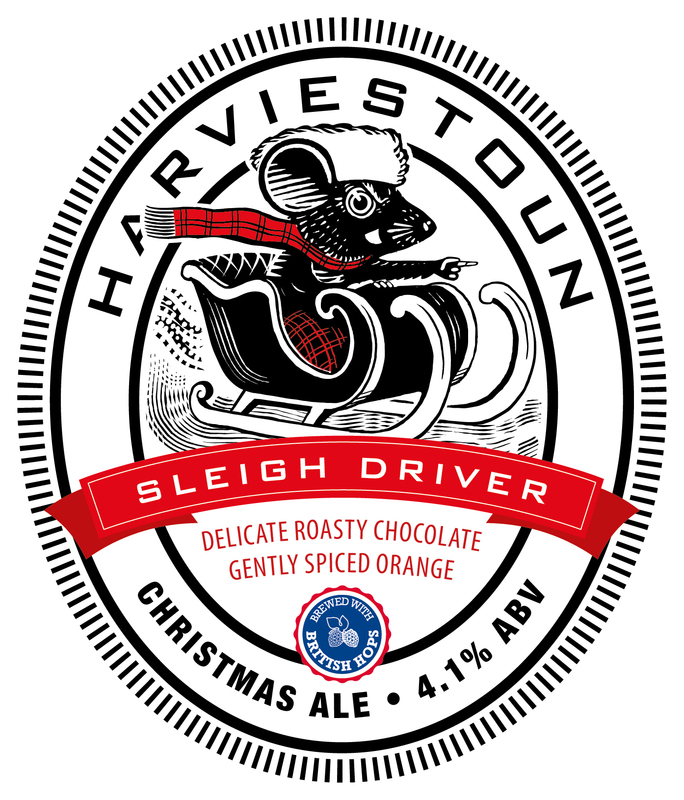 Finally we tuck into Sleigh Driver (4.1%), the offering from The Beer Cast’s Richard Taylor and Harviestoun. This beer is made exclusively with British hops, which come through with an earthy nose with hints of dried fruit. It is bitter and quite heavy, with a lingering coffee aftertaste. We reckon this would be cracking with Christmas pudding. “For me, the most exciting aspect of the beer is that it features only British hops” says Taylor. “For years, breweries here have been experimenting with hops imported from around the world; but British hops impart some truly unique flavours and it is great that they have been championed in this way”. This is something Ben picks up on when tasting the beer. “I think it would lighten the bitterness if it was served through a sparkler,” he says, referring to the device that aerates and froths beer upon serving. “It would change the flavour if it was served that way.” Perhaps the Northerners are on to something there. This is the third year that Nicholson’s have run a range of special Christmas beers. Whereas some breweries already have festive specials, others were only too happy to have a play around with seasonal flavours. The only element that was dictated by the chain was the final ABV – everything else was up for grabs. As Ben points out, “it’s a real investment to take your staff to the breweries. But engagement levels just soar.” Building a relationship between staff and brewers is obviously important to Nicholson’s, and this initiative gives the Cask Masters an opportunity to deepen their knowledge about the beer they serve. “How many staff behind a bar can say they helped brew the beer they’re selling?” asks Ben. So what’s next for Nicholson’s? There will be a Spring Ale Festival in the last week of March going into April, and a special event for the World Cup in June, pitting 25 beers representing 10 countries against each other with voting over social media. We’re looking forward to it already… once we’ve worked our way through the winter range! The special Christmas ales will be available exclusively to Nicholson’s from now until Christmas across the 77 pub estate and joins their 25 winter ales available on rotation until February. 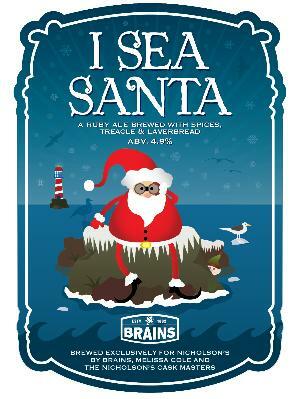 This entry was posted in Festivals/Events and tagged Beer, Brains Brewery, Christmas on 06/12/2013 by icipints. Pingback: Hopping into Spring: an afternoon at the Nicholson’s Spring Ale Festival | It Comes In Pints?